REVIEW: Amici di Enzo delivers Italian standbys in hefty portions | Food and Drink | Style Weekly - Richmond, VA local news, arts, and events. 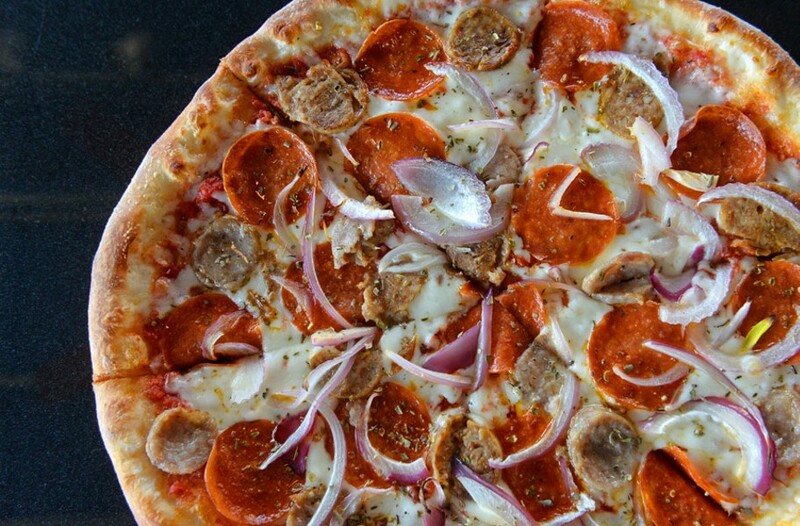 Scott Elmquist Pepperoni, sausage and red onion top the pizza carnivora at Amici di Enzo. I love innovative menus as much as the next guy. But sometimes I just want something familiar, without surprises or flourishes. Fried pickles are delicious, sure, and I'm willing to bet they taste good on a burger. But do they actually up the ante? And mac 'n' cheese — how often does it really need lobster? Grilled cheese is a favorite standby, but for me you can hold the fig marmalade. When it comes to Italian food, plenty of restaurants offer the token spaghetti and meatballs, lasagna and some form of pizza, be it flatbread or hand-thrown, but how many offer a variety of full-fledged, old school, home-style dishes? Now comes Amici di Enzo — owned by half the team as the former Amici in Carytown and in the old Enzo's location in Goochland — with a menu that has more than a smattering of traditional Italian comfort foods. That isn't to say there are no exciting innovations at Amici di Enzo's. The Torre al Granchio ($16), for instance, is a vertically composed salad with a base of baby greens, a layer of avocado, halved cherry tomatoes and bits of roasted red pepper, capped with a more than generous layer of sweet lump crab. The light basil dressing is so deliciously delicate that the flavor of the crab takes center stage. But as captivating as such creations are, Amici di Enzo outstrips the competition in delivering the classics the way they were intended. Humble meatballs, or polpette di carne ($11) are two baseball-sized spheres of beef and pork so finely ground and moist that they're almost creamy, garlic-laced tomato sauce is thick enough for dipping crusty, freshly-made bread and plentiful enough that it's like getting two appetizers for one. Faced with several "special occasion" (meaning ignore your diet) choices, we skipped the salad section, but it, too, has traditional choices. Caesar ($7) and caprese salads ($10 each), standard on many menus, are included along with two flashier options: ruchetta, with arugula, fennel, dried cranberries and tart Granny Smith apples tossed in a light tarragon dressing, and capricciosa, featuring mixed greens, tomatoes, carrots, mushrooms, cucumbers and red peppers with a balsamic dressing (both $7). All could be paired with any of the pizza variations, which come in small or large sizes. The small is large enough to be dinner for two alongside an appetizer or a salad. In the interest of full disclosure, I have my biases when it comes to pizza crust. While I don't claim to be an expert, I've eaten a lot of pizza, and very few crusts come close to beating Mary Angela's in Carytown. Slightly chewy with a crisp finish, Amici di Enzo's crust is, believe it or not, just as good. The pizza section of the menu includes gold standards like margherita and bianca (white) alongside edgier options like prosciutto and mushroom and a vegetarian choice with spinach, onions, mushrooms and peppers. We went for the salsiccia and cipolla, in which red onions played the foil to sweet Italian sausage and pepperoni. Small pizzas cost $10-12 while large pizzas go for $15-18. Always ask what the ravioli del giorno is. Unless you're allergic to the filling of the day, the freshly-made pasta pillows should not be overlooked. On one of our visits, little beef-stuffed ravioli came with a tomato-cream sauce, the cream muting the tang of the tomato as well as balancing its acidity. Weighted toward traditional Italian, the menu's secondi piatti is where this restaurant shines. The classics — including spaghetti carbonara ($13), chicken parmigiana ($21) and veal marsala ($26) — dominate the section. On our second visit, we tried the meaty rigatoni bolognese and found it to have a fullness of flavor that comes with a long, slow simmer. For those who find the classics a bit lackluster, a few entrees offer a little more intrigue. The anatra alle ciiege ($25) is a duck breast with black cherry and a white balsamic demi-reduction, and the sizable salmone limoncello ($26) delivers the flaky pink fish fillet in a limoncello glaze with lightly cooked broccoli and sliced fingerling potatoes. If I had any complaint, it would be that the glaze was delivered with a slightly liberal hand and the vegetables and fish ended up tasting too much alike. So go ahead and add lobster to your mac 'n' cheese, pile the fried pickles on your burger and slather marmalade on your grilled cheese if you like. Experimentation and odd pairings often beget stellar dishes. But if you want straight-up classics or the comfort of the familiar, Amici di Enzo's offers plenty of choices as they were meant to be. Mondays 4 - 9 p.m.
Tuesdays 11 a.m. - 9 p.m.
Wednesdays, Thursdays 11 a.m. - 10 p.m.